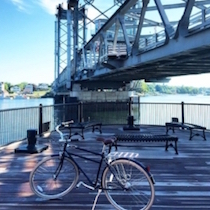 DID YOU KNOW: The Benefits of Biking, Seacoast Style! Peddle your bike through the streets of Portsmouth and enjoy incredible rewards at local businesses! Meet Bicycle Benefits – a program that encourages people to skip the car and use a more eco-friendly method of travel – our bikes! Scoot over to Vida Cantina and enjoy complimentary chips and guac. Bike to White Heron and receive 15% off prepared drinks! Intriguing, right? So, how do we join the fun?? Purchase a tiny, $5.00 Bicycle Benefits sticker (at participating locations), and use it to bedazzle your helmet. Enjoy a beautiful Seacoast bike ride to one of your favorite hangouts, show your sticker, and reap the rewards! It’s as easy as that! Are you a traveler? Use your Bicycle Benefits sticker in our neighboring cities of Portland and Boston, as well as many other cities, big and small, across the U.S.!